Although captive shot blasting is the technique of choice in the surface preparation industry, there are areas where conventional open blast techniques are still appropriate. Our Open blast range of shot blasting equipment & tools caters for this need. SPE Open Blast equipment - a range of products combining efficient operation with maximum site safety. The SPE Open Blast range offers a choice of products suitable for tasks ranging from small scale remedial work to much heavier duty professional contracting. With all units hydraulically tested to twice working pressure, and specially designed low pressure versions available, they are not only efficient but very safe to use. SPE Open Blast products are ideal for blast cleaning concrete and steel alike - finding uses in shipyards, construction and petrochemical industries to name but a few. 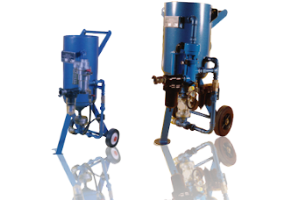 The SPE Open Blast Range of equipment offers the user a choice of portable abrasive blast cleaning machines combining efficient operation with maximum site safely.